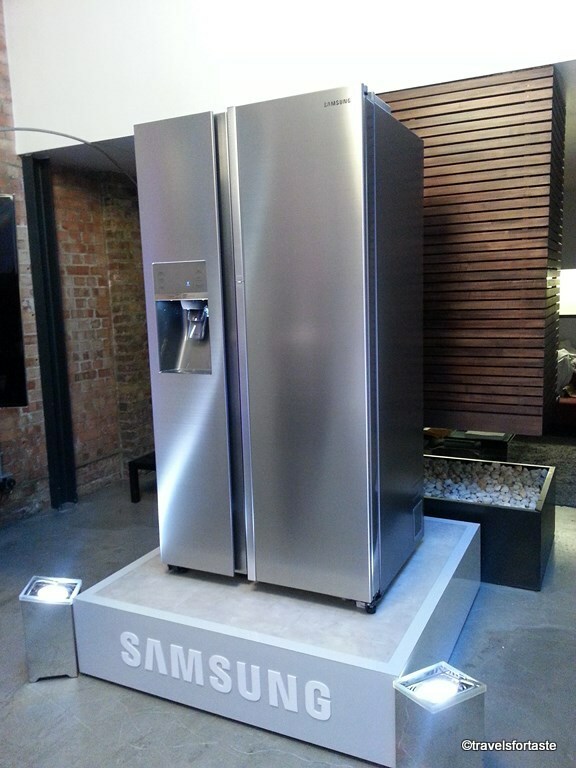 You are here: Home / Food / Events / Samsung Food Show Case Refrigerator Launch – a Tall,Sleek and smart Fridge! 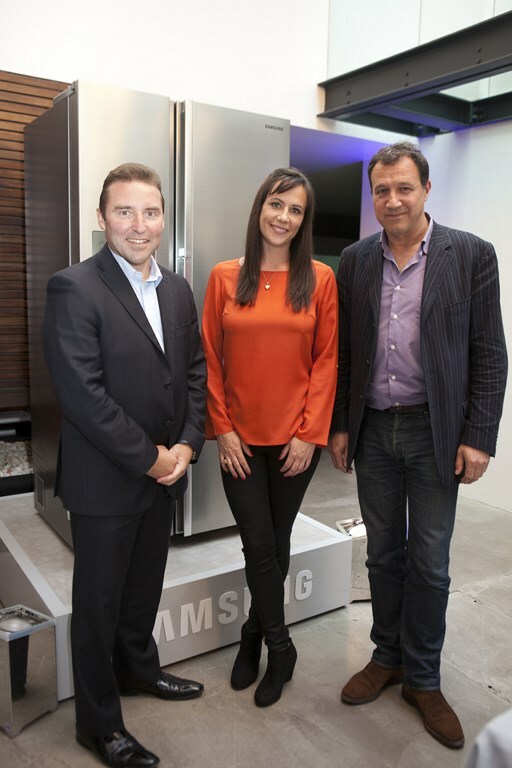 Samsung Food Show Case Refrigerator Launch – a Tall,Sleek and smart Fridge! I always thought that Central London would have cramped accommodation but that notion was blown to bits when I took a house tour the very modern but charming – Violin Factory – Conversion of a crumbling old ruin that the old violin factory was into a fully equipped, functional house ,ney a luxurious loft-style home!Also the venue for the UK launch of Samsung’s latest innovation a 28.5 cu ft shiny ,smart refrigerator with multi functional space organising and energy-saving design. 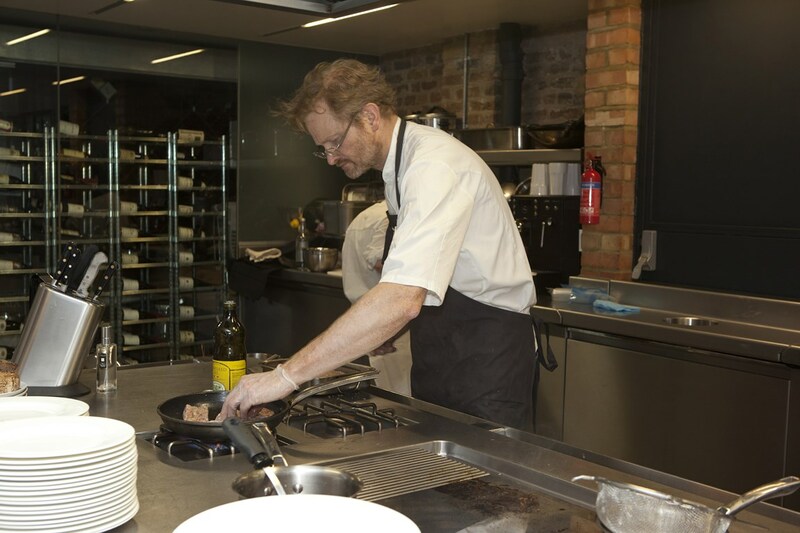 The V.P of Consumer Electronics for Samsung UK & Ireland Robert King took us through the features and utility of the Samsung Food Show case Refrigerator. 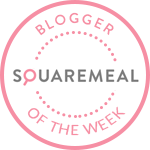 What better way to showcase such snazzy features than by calling in a professional declutterer to the celebrities – Vicky Silverthorn(Yes! That sounds like an awesome profession to be in right?!) . 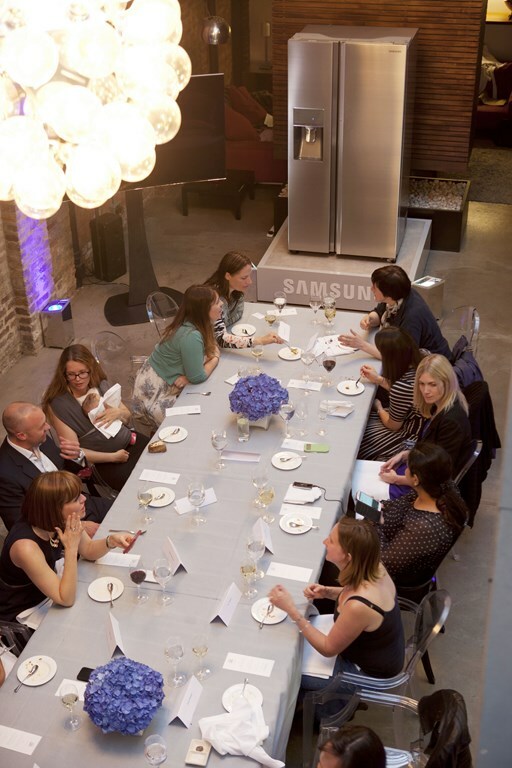 Vicki took us through simple but brilliant ideas on how to organise space in the kitchen and optimise utilisation of all available space inside the Samsung Food Show case Refrigerator. 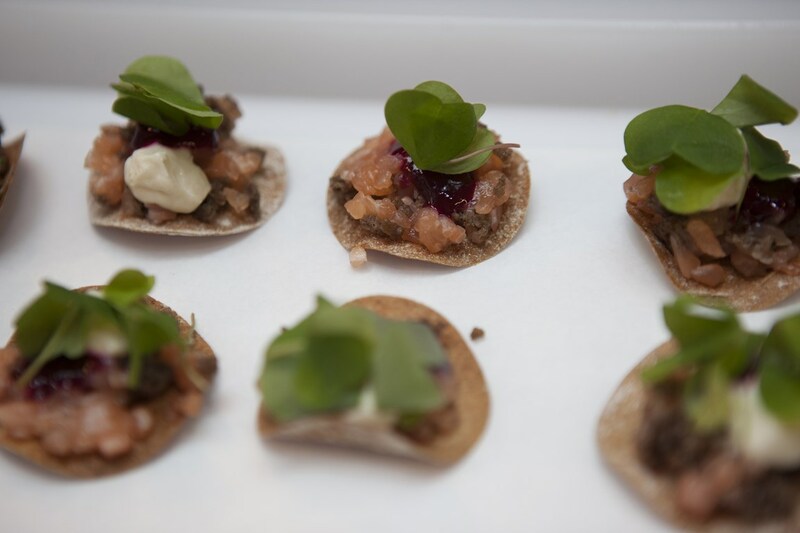 While we bloggers sat down to enjoy Champagne , the efficient team of chefs led by Michelin Starred Chef Mikael Jonsson of Club Des Chefs served us canapes ,followed by Tapas style mains including Pork Belly. FoodScape Photographer Carl Warner who’s foodscapes are all works of art , created a foodscape inspired by the Samsung Food Show case Refrigerator. And why not I say the Innovative Organization with Easy Access to On-The-Go Items is good enough to inspire art. Why the name Food Show Case ? Well, the most intriguing part of the design for me was the Inner and Outer cases ,its like a opening a huge pop up book! The space available in this refrigerator can be sensibly utilised and actually customised to easily organize your food by type or family member.The exterior showcase gives you instant access to drinks and condiments – Perfect for frequently used items, while the Inner Case lets you store large, fresh food items.Think little people who love opening the refrigerator door just to gaze inside or cool themselves on hot summer afternoons 😉 not to mention the menfolk who love admiring the beer stacked inside – wonder why 🙂 . No surprise then that this Samsung refrigerator not only meets ENERGY STAR® requirements, it exceeds them! Metal Cooling locks in cold and seals in freshness while the sleek and smart stainless steel paneling helps maintain consistent temperature throughout the refrigerator and it does good things to the external appearance of this beauty.Don’t we all want things to be as simple as pressing a few buttons and set things in place , well the external Ice Blue Digital Display does just that !! 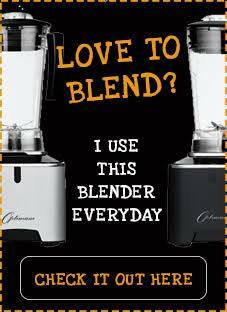 It allows you to easily control settings at the touch of a button. The freezer design is again pretty smart Thats not all ,the Automatic In-Door Ice Maker can produce up to 4.2lbs of ice per day and stores up to 5.5lbs of ice! You can get crushed ice too!Woohoo bring on the parties ,barbies in summer, kiddie birthdays with icy cold drinks and the cocktail and cheese nights for us adults! High-Efficiency LED Lighting emits less heat and is more energy-efficient than conventional lighting. 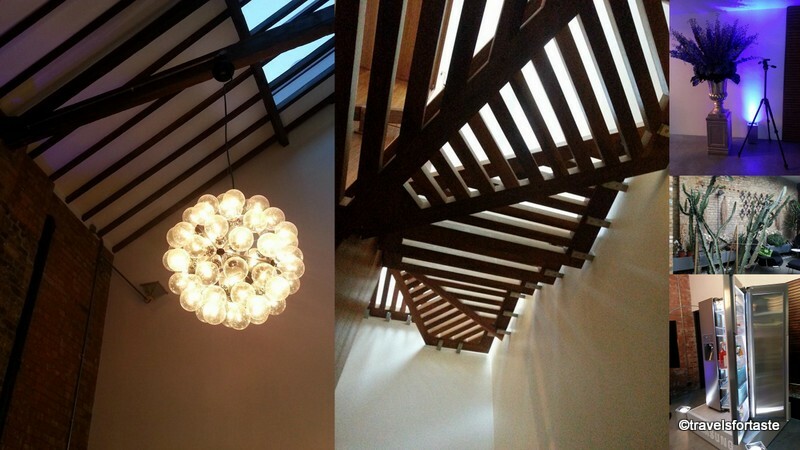 The sleek design saves more space than traditional incandescent light bulbs. Need more convincing ? It comes with a vacation function – smart for when your away for long periods it saves energy and there’s always something to come back to when your back late with a hungry family in tow. As far as I can think of Samsung has thought of everything one could wish for! 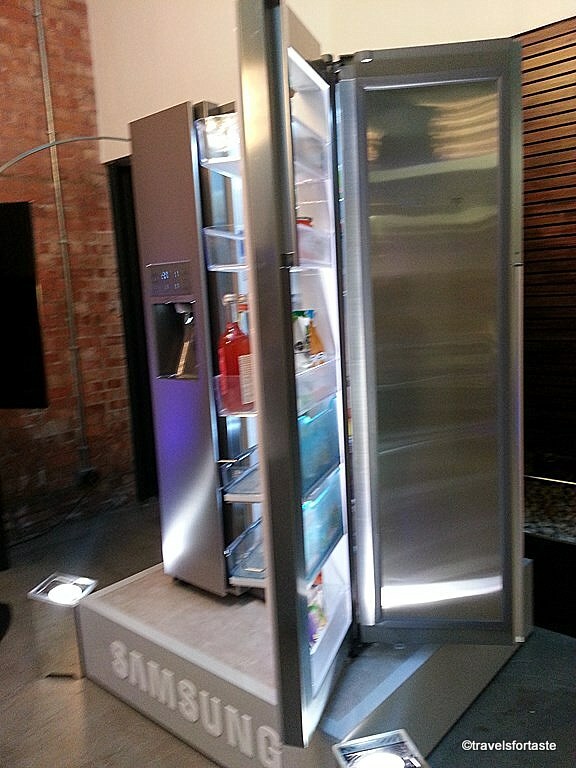 This fridge gets top marks and is on my want list ,I would love to have one in my kitchen – cough cough anyone at Samsung listening? 😉 Space, utility, common sense, energy saving,child safe lock function,vacation mode ,adjustable shelves,a smart double door to ensure easy access to things that one needs the most – the Food Show case has it all, combined with its sleek ,modern good looks it will fit well into any kitchen – modern or rustic alike! I manged to find time to chat up Vicki and she gave me some fab wardrobe organisation tips especially for the n number of black trousers I possess! After which we were taken on a tour of The Violin Factory, I couldn’t help but think of how fab this conversion home is for a fashion model photo shoot, wat with one of the main bedrooms that is equipped with a concealed jacuzzi and the fabulous skylights. There is a fab nook at the very top – a desk where your creative juices would absolutely flow unabated! Sigh… think dream house! *With thanks to Samsung for the invite . « Cheap day out in London? 5 places to visit this Summer! 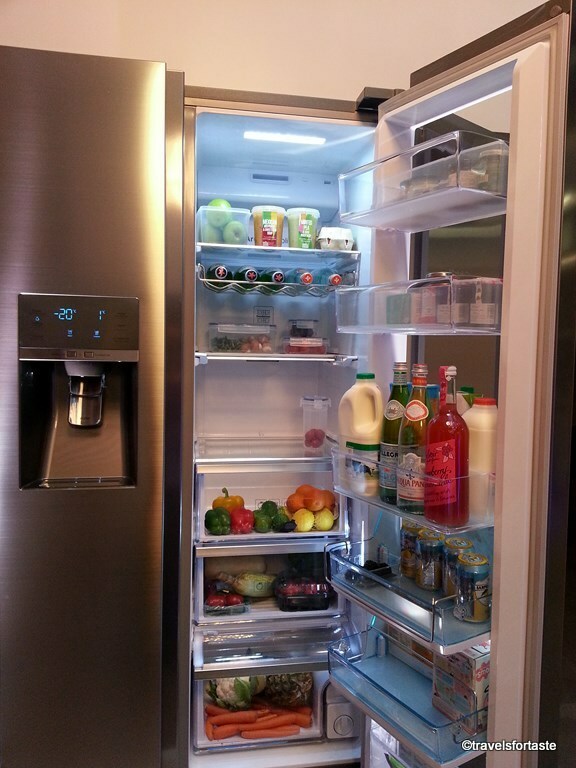 What a stunning fridge – I am big on Samsung product and you should see how many Samsung things I have my house. I just now need this fridge. Plus the professional declutter lady. This fridge is something else isn’t it ? !Yes we all ”Need a Vicky” ! Isn’t it something else Bintu? yes we are Samsung people too!yes yes we all Need a Vicky in our life! Wowsers, I WANT this fridge!!! Major fridge envy now. I used to have a Samsung fridge but believe me it wasn’t like this one. 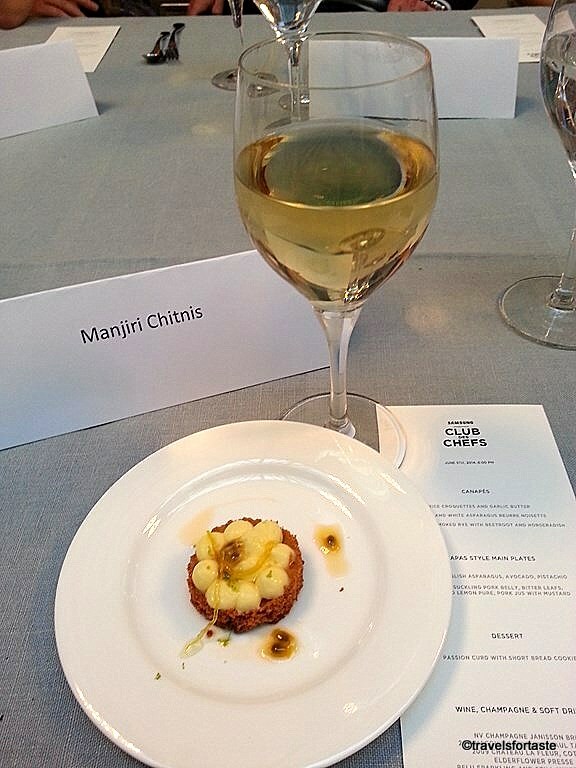 Great event, looks like lots of fun Manjiri! hehhee yes we ALL want that fridge , would be the end of my cribbing …well for a long time atleast.Thanks Lou yeah it was a fun event! Wowsers, that thing’s a beast! 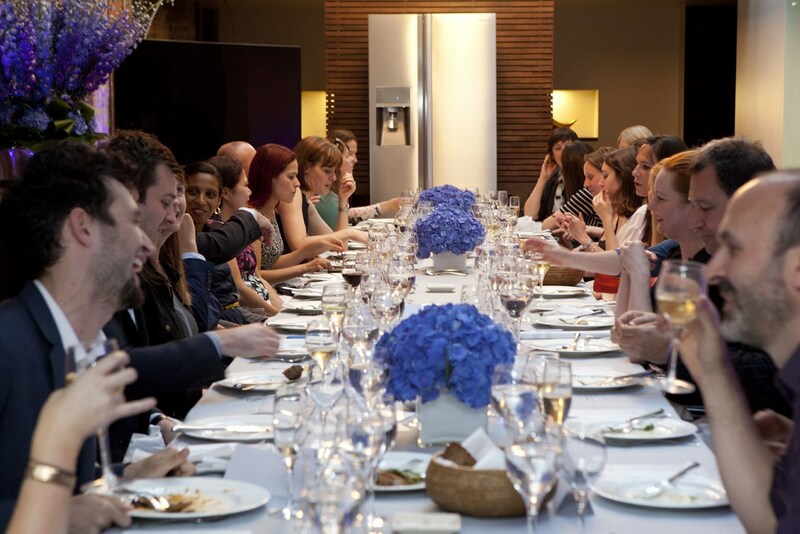 And it’s officially the first time I’ve ever seen a fridge at the head of the table! 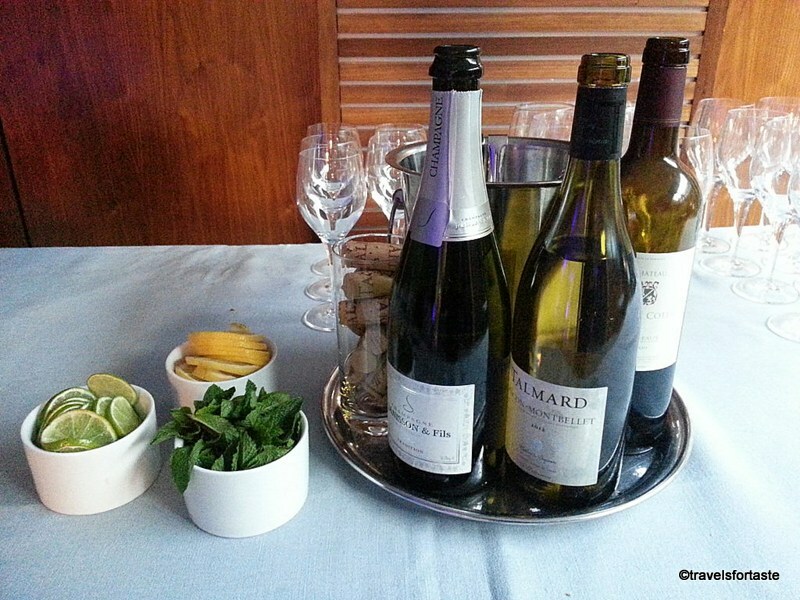 Glad you had fun Manjiri! I always think of phone when I think of Samsung and I am Samsung all the way but I would love a fridge like that. Unfortunately I’d need a bigger kitchen first. Totally sold on the design. it must be really cool..
oh yes indeed its beyond cool !